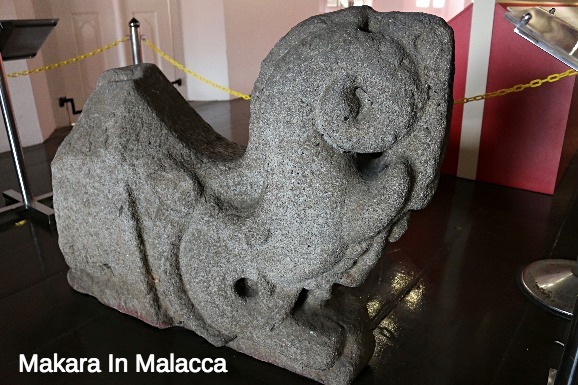 There is a granite Makara in Malacca, on display in the Ethnology Museum in the former Dutch Stadthuys building. A Makara is a mythical creature combining a fish and a mammal. In this case, the Makara has the tail of a fish and the head and trunk of an elephant, although it is so badly weathered that the tail is not easily apparent. The motifs that are used in the Makara show that it was introduced into Southeast Asia through Hindu culture. Its significance is unclear but Makara were found in the ‘Kala Naga Makara’ combination in the framework of chandi or temple entrances. The granite Makara is the only one found so far in the peninsula. 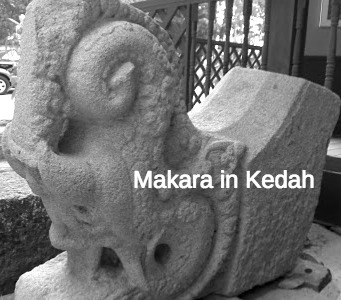 How the Makara came to be found in Melaka is a mystery. 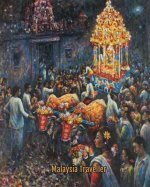 The Hindu period of Melaka was not a long one. There is no evidence that the Portuguese, Dutch or British constructed buildings with Hindu motifs. It is possible that Parameswara as a gift brought this stone here to the Melaka Sultanate. The Portuguese could have used this stone together with royal gravestones to build the Melaka fortress. The destruction of the fortress may have unearthed the Makara as it did the gravestones, which were found later. The British placed the Makara on display as they did the other motifs and plaques found along this wall. It is possible that the Dutch may have brought it from Java as they had the means to do so. But this Makara does not show any evidence of Javanese art and is truly a mysterious artefact. 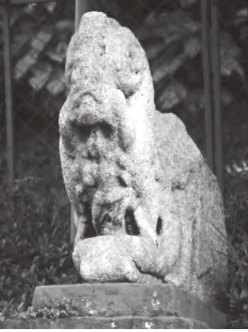 As mentioned by the museum, this Makara used to be displayed on the stone wall next to the Stadthuys, opposite the Melaka Tourist Information office. It was probably brought into the museum to prevent further damage from the elements. Alongside the Stadthaus is a Makara, a monster of Hindu mythology, the sole surviving relic of the time when the Ruler of Malacca was still a Hindu and should date from 1403 or earlier. 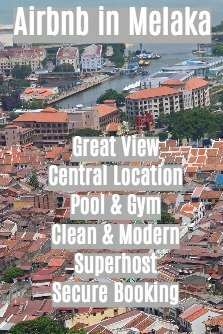 It is therefore the oldest work of men's hands in Malacca. From this photo of the Makara while it was still outdoors on the wall you can make out the figure of a man standing with one leg raised in the open mouth of the creature. The Ethnology Museum said that this Makara is the only one found so far in the peninsula but another one has since been found Kampung Sungai Mas in Kuala Muda, Kedah and is believed to be from the 7th Century A.D. It is very similar in appearance, although in better condition, and they could be a pair. I believe this second Makara is now on display at Bujang Valley though I did not see it when I went there some years ago. The same Makara is on display at KL’s National Museum which is apparently a plaster cast of the original, unless it is actually the original which has been shifted here. Perhaps somebody who is more knowledgeable could comment and help to unravel the mystery.